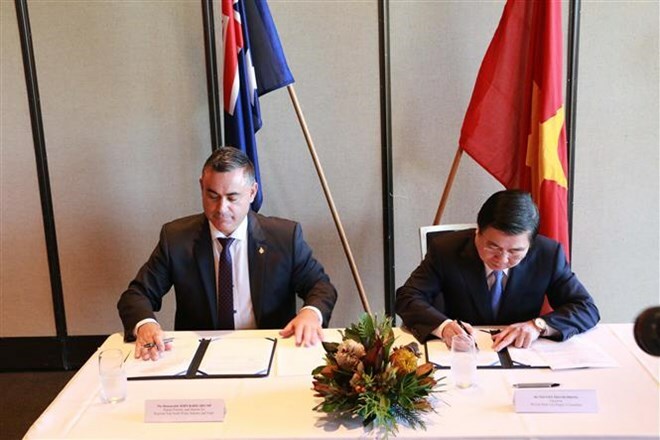 Sydney (VNA) – A Memorandum of Understanding on the establishment of cooperative and twining relations between Ho Chi Minh City and the Australian state of New South Wales was signed in Sydney on April 17. Under the MoU, signed by Chairman of the HCM City People’s Committee Nguyen Thanh Phong and Deputy Premier of New South Wales John Barilaro, the two sides will focus their cooperation in the fields of mutual interest, including education-training, resources and energy, agriculture and food, startups, small-and-medium enterprises, infrastructure and business investment, science-technology and tourism. Addressing the signing ceremony, Deputy Premier of New South Wales Barilaro highlighted the sound relations between New South Wales and HCM City in all fields and affirmed that the signing of the MoU shows both sides’ commitment to boosting trade and investment and strengthening their bonds. Earlier on April 16, Chairman Phong and his entourage visited the University of Technology Sydney (UTS). Phong expressed his wish that the university will share its experience in human resources training for the fourth Industrial Revolution. He wanted to promote the possibility of cooperation between UTS and HCM City’s universities on human resources training. Prof. Attila Brungs, Vice Chancellor of UTS, spoke of the city’s programmes on smart city, innovative urban area and innovative startup centre development, while affirming that UTS will send experts to Vietnam to seek opportunities for cooperation in training high-quality human resources for HCM City. At the Sydney startup centre, Phong and his entourage learned about support policies for startups. He wished to learn experience in building a startup community support model and possibility for cooperation between the startup centres of HCM City and Sydney. The same day, he visited the Vietnamese Consulate General in Sydney.